St Kilda Repair Cafe at Port Phillip EcoCentre, October 2017. Fix your broken stuff rather than throw it out. A new repair cafe is starting up in St Kilda on the second Sunday of every month (except January) from November 12. The fix is in: make do and get it mended for free, October 2017. At least eight regular repair cafes have opened around Victoria, in a return to our grandparents' practice of fixing stuff rather than sending it to the tip. Many more are being planned, including one starting in St Kilda next month. Volunteer jewellers, mechanics, clothes repairers and electricians tackle customers' busted bicycles, kettles, hats and clocks. Let's Talk Bayside, August 2017. Scouting for change: A young sea scout taking action on the environmental dangers of microplastics has won this year's Bayside Youth Community Leader Award. Port Phillip EcoCentre scores $600,000 grant for Water Workbees and Clean Bay Blueprint, June 2017. The centre’s Living Water Workbees and Clean Bay Blueprint projects are among 36 new initiatives to share in $3.57 million from round one of the state’s Port Phillip Bay Fund, aimed at protecting the health of the bay and the wider bay catchment area. Beach advocates shocked at 'worst case' nurdle plastics pollution at Rye Beach, May 2017. Rye has been hit by the “worst case” of plastic pollution ever seen in the region. Beach cleaning advocate Josie Jones discovered thousands of nurdles (microplastic pellets) this morning while doing her daily sweep of the beach. 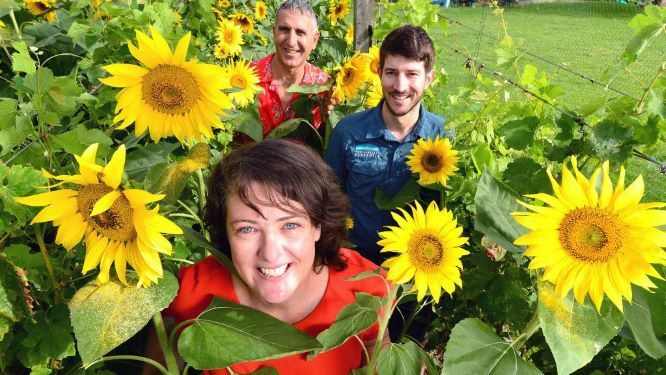 St Kilda’s Veg Out Community Gardens set to come alive with sunflowers, February 2017. Jo Wallace, Salvatori Lolicato and Anthony Gallacher among the sunflowers being prepared for next weekend’s sunflower forest. 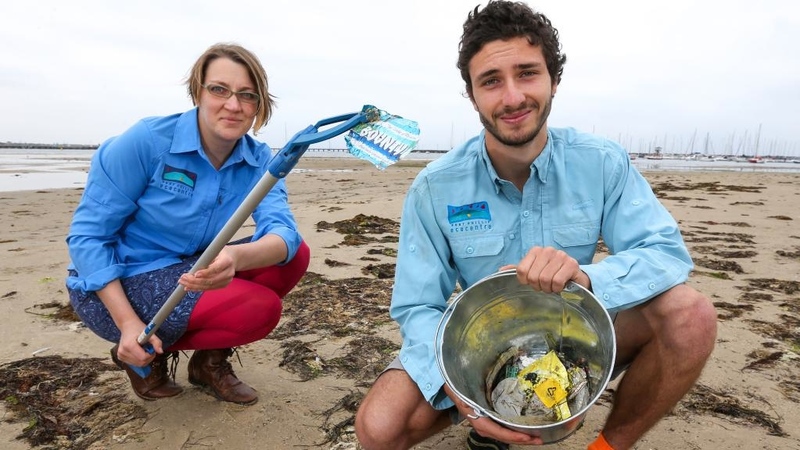 Port Phillip Bay polluted with microplastics, experts say, May 2014. Melbourne's bays and rivers are in danger of ­becoming a “plastic soup” if nothing is done to curb litter from spilling into the city’s waterways. Eco-volunteer Baykeeper program to tackle plastic pollution on beaches and in Port Phillip Bay, May 2014. Environmentally conscious people are being encouraged to join a volunteer movement to rid beaches and Port Phillip Bay of the threat of microplastics.